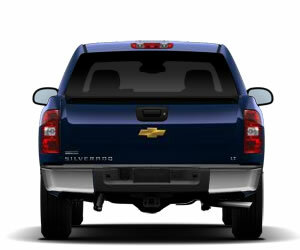 The Z71 Appearance Package, available on Chevy Silverado Extended Cab Standard Box and Crew Cab Short Box models, includes body-color front bumper lower and center sections with body-color end caps, a body-color grille with chrome insert, unique Z71 decals, bright door sill plates, chrome recovery hooks, body-color outside mirrors and door handles and fog lamps. 18" aluminum wheels and 18" tires and front and rear Rancho shocks raise the Z71 performance level even higher. On LT models, requires Extended or Crew Cab models, Trailering Package and Z71 Off-Road Suspension Package. Tires may be upgraded to on-off road tires. Not available with exterior color Imperial Blue Metallic or Steel Green Metallic. On LTZ models, requires Extended or Crew Cab models and Z71 Off-Road Suspension Package. Tires may be upgraded to on-off road tires. Not available with exterior color Imperial Blue Metallic or Steel Green Metallic. In order to choose this feature, you also need to add the Z71 Off-Road Suspension Package, 18" x 8" aluminum wheels, on and off-road blackwall tires, high-capacity air cleaner, heavy duty trailering package, heavy duty cooling, auxiliary external transmission oil cooler, heavy duty automatic locking rear differential, chrome recovery hooks, and the skid plate package. Whether you're maneuvering around a construction site or heading for some mud-slinging, off-road recreation, the legendary Z71 Off-Road Package lets your Chevy Silverado take it in stride. It includes 46mm high-pressure gas-charged shocks, a 36mm front stabilizer bar and off-road jounce bumpers to absorb large suspension inputs. When youre really into the deep stuff, the included Skid Plate Package is there to protect the truck undercarriage from rocks and debris. This package also includes an off-road air cleaner. front recovery hooks and Z71 decals on the rear quarter panels let everyone know your pickup is up to the challenge. In order to choose this feature, you also need to add the high-capacity air cleaner, heavy-duty automatic locking rear differential and skid plate packages to your build. Z71 Off Road Package on the 2011 Chevy Silverado 1500 Crew Cab 4X4.